With reference to the initial stock announcement on 19 July 2018 by Subsea 7, Seaway Heavy Lifting, part of Subsea 7 Renewables & Heavy Lifting Business Unit, is pleased to confirm the award of the Triton Knoll contract. 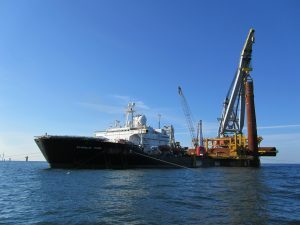 The sizeable contract scope includes the transport and installation of 90 WTG foundations and two offshore substations and was awarded by Triton Knoll Offshore Windfarm Limited. Triton Knoll is a consented offshore windfarm being developed by Innogy Renewables UK. The project is owned by Innogy SE (59%) and partners J-Power (25%) and Kansai Electric Power (16%). The windfarm is located in the Greater Wash area, approximately 33km off the coast of Lincolnshire and 46km from the North Norfolk coastline. Once fully operational, Triton Knoll Offshore Windfarm will be capable of supplying the equivalent of 800,000 UK households with renewable electricity.